"Welcome to my website! Are you, or someone you know, facing some business or personal challenges? Who isn't? Potentially interested in some suggestions and guidance? If so, I suggest you look briefly at my website, and then consider contacting me. Even though everyone's goals and challenges are unique, I developed 5 basic steps to jumpstart positive change, to improve a wide range of situations. You simply do Steps 1 through 4 on your own, and then I will work with you on Step 5; it's all free. This website is full of self-improvement tips, ideas, and suggestions. Look around and enjoy! You may want to listen to some recent podcasts, subscribe to my newsletter "Great Changes Ezine", and/or contact me. Very simply put, key steps to greater success include: 1) realistically evaluating one's situation, 2) assessing strengths and challenges, 3) setting realistic goals, 4) making plans to meet or exceed one's goals, and 5) taking the necessary, required actions steps. Although this may sound simple to do on one's own, very often finding a business coach, consultant or counselor will speed up the progress and improve the results. I created this website to help people achieve more success. Some come to find ideas and suggestions to challenges they face, and others are looking to find a business coach, relationship coach, or consultant, an experienced expert to talk with directly. The 5-Step Jumpstart process includes my video presentations called "Making Great Changes Happen in your business, career and personal life". Step 2 is the condensed version and Step 4 is the full version; they have both been well-received. If you would like to check them out, simply press the Step 1 button. Enjoy! make a living at doing what they most enjoy." - Billionaire Businessman Malcolm S. Forbes (1919-1990) See what he's saying? MOST PEOPLE DON'T WRITE AND SET SMART GOALS but would be much more successful if they did! So find a business coach, consultant or someone to help you set goals and stay focused. Find your passions and figure out how to make a living doing something that makes you happy! The main focus of this website is to teach the basic process of making positive change, giving visitors specific information they will find educational. Various other Assessments might include a Leadership Assessment Test, a SWOT analysis (see these swot analysis examples, and here's a Southwest Airlines SWOT Analysis), or my executive assessment, a process I've done with many people, to evaluate one's situation and make plans to move forward. We all have are unique blend of strengths and challenge areas. Strengths are what we do well, and typical enjoy doing, while our challenge areas are typically what we don't excel in or enjoy. Some people's challenges include learning time management skills so you can have better time management in the workplace, lacking some sales skills, sales and marketing, or depression or procrastination, which often go together. If you tend to procrastinate, you may be interested in this procrastination test, some research on procrastination or, if you're ready for a laugh, some procrastination humor! Why is S.M.A.R.T. Goals Setting So Important? S.M.A.R.T. Goals are goals that are Specific, Measurable, Attainable, Relevant, and Timely. People who are serious about setting goals tend to be successful at achieving them. Why aren't people more focused, and occasionally get "stuck", not quite sure what to do next? It's often because they haven't been setting smart goals, a process which helps focus us. New Years Resolutions are goals, too: Check out Top New Years Resolutions, or New Years Resolutions for Kids. Wanna chuckle? See these Funny New Years Resolutions. 4) Make an Action Plan! Writing out a personal plan of action or business plans is as important as writing out your goals. Maybe one of your goals is to improve your website. Whatever your goals are, prioritize them, and break them down into actionable steps. Set realistic dates when you expect to complete each step. Read your actions steps often. While you read them, visualize doing them and completing them. Now is when "the rubber should hit the road"! But will it? Some people find it easy to plan the work, and hard or next to impossible to work the plan. Others like to take action without making plans (know the expression: "Act in haste and repent in leisure"?) While others, find it hard, on their own, to do either. Only about 3% of people are motivated and focused enough to write out their goals on their own, and see their plans through to fruition. Any wonder why these 3% control 50% of the world's wealth!?!? Business ideas, suggestions, and analogies: here you will find some green business ideas, the low hanging fruit principle, and how doing a business tune-up is like doing a car tune-up. Communications: Improving communications between people and within organizations should often be a high priority. What we say and how we say it makes a huge difference in the outcome. This is why I've written about business cliches, and why they can be misleading, more misleading business cliches, and other popular cliches. Jargon: is unusual phrases primarily used in select groups. Here are many examples of jargon, including business jargon, police jargon, and ways of understanding computer jargon. It's important to know how and when and when NOT to use jargon. E-Newsletter: Business Tune-Ups emails out our business coaching newsletter, "Great Changes Ezine", which focuses on various subjects of how to get ahead in your business, career, and personal life. 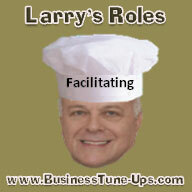 Those that subscribe can sign up for a free coaching session with Larry. Click on Business Coaching Newsletter Backissues if you would like to read some past newsletters before subscribing. About Business Tune-Ups: In addition to this website and newsletter, Business Tune-Ups does business leadership coaching, business management consulting, small business coaching, executive coaching, business coaching to groups, brainstorming, mentoring, and relationship coaching. It also does other business services, mostly depending on the needs and desires of the client. 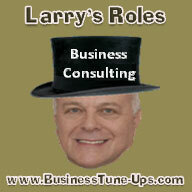 Note: The theory of business coaching explains how coaching differs from consulting. 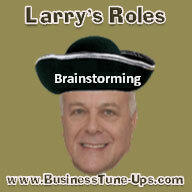 For more information, also see the executive coaching site map and the executive coaching blog. 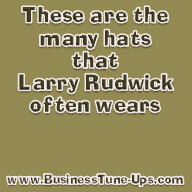 About Larry: Larry Rudwick's initially went through an "inventor phase" (see Rudwick patents) shortly after graduating from college. Then he became a co-founder in an ultimately very successful wheelchair parts manufacturing and distribution business, where he helped add sales and marketing features to the enterprise distribution software that was used. 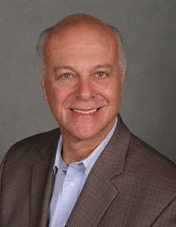 Larry later earned an executive coaching certification, and has helped hundreds of people improve their businesses, careers, and personal lives. 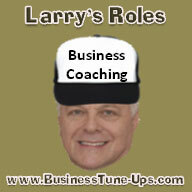 He sometimes suggests to people to "find a business coach". There is even an expression that coaches have: "Even coaches need coaches!" 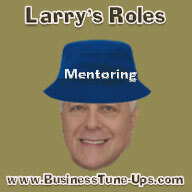 Larry has learned that a good, experienced business coach, consultant or mentor can help virtually anyone that truly wants to move ahead. In fact, some of the people who visit this website decide to confidentailly ask Larry questions through his business advice center page, for some free advice. Want to Help Others Find a Business Coach?!?! Enjoy this page? Please tell others about it. Here's how... That link is located just above the brown background footer of most pages; clicking on it will provide the HTML code to use to link to that page. 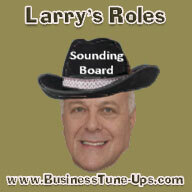 "Larry gave me good guidance when I started in this position, including helping to re-organize our sales and marketing efforts... The company was successfully acquired by a public company in our industry... I feel Larry's help contributed to our success.... Charles H."
"I can't thank Larry enough for creating the opportunity for me to really see what it is I wanted in my life... After my professional life began to come together, my personal life also blossomed... Deborah W."
"Thanks Larry... 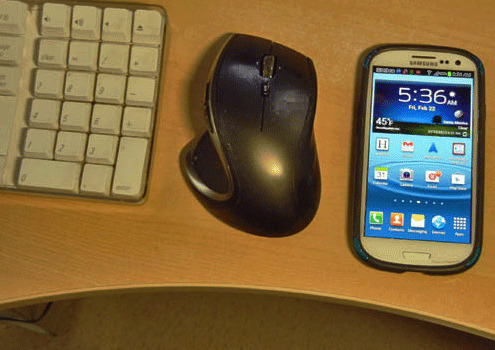 I questioned how effective doing employee reviews over the phone would be... However, you have a "sixth sense" and were very effective... I eventually understood why you made the recommendations and then implemented them. What an improvement!... Soraya C."
For more testimonials, click business consultant referral (brief business coaching testimonials) or written testimonial (expanded business coaching testimonials). Are You a Good Prospect? Do you have up-to-date written goals: If not, are you willing to think through and write down your goals with some encouragement? Do you frequently have problems staying really focused and on task? If so, there are steps to take that can help. Are you interested in improving your work and/or personal situation? Are you open to ideas from an "outsider"? Note: If you answered YES to most or all of the questions above, you are probably a good prospect. Are you Coachable? You also might like to take this 2-minute quiz called: "Am I Coachable? "; you'll see your results immediately! BusinessTune-Ups is based in the Dunn Loring, Merrifield section of Vienna (Fairfax County), near Tyson's Corners, McLean, and Falls Church, in Northern Virginia. The main requirement for executive business coaching with me is to speak and write English, and have access to a phone and/or Internet connection. Otherwise, you'll need to find a business coach that speaks your language. We have clients and alliances in the Washington Metropolitan Area (including Rockville, Bethesda and Gaithersburg in Montgomery County - Suburban Maryland), Arlington, Alexandria and Springfield, Northern Virginia, Baltimore Maryland, Atlanta, Augusta and CSRA Georgia, Long Island and Manhattan, New York, Providence, Pawtucket and Smithfield, Rhode Island, New England, Denver, Colorado, Texas, California, the West Coast, other locations in the USA, Canada, Great Britain (U.K.), Sweden, Australia, and more; I'm just a phone call or mouse-click away! I wish you well: success in your pursuits and that you reach the level of contentment you desire. Why find a business coach? Here are some benefits of business coaching. If you would like a "jumpstart", click on Step 1. Find a business coach, consultant, or someone else who resonates with you. It will increase your chances for quicker, better success. Good luck!